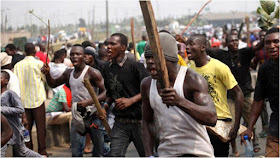 No fewer than five people from Ngbo, Ohauwwu, municipality of Ebonyi, were killed Wednesday by gunmen suspected of being from the Agila community of the Benue state. Victims were reportedly killed following the renewed border crisis between the two states, which has been in existence for over forty years. It was found that some people in the affected Ngbo community said they had fled the area for fear of further attacks. Police commissioner Musa Kimo, who visited the scene, said everything had been brought under control. He urged people in the region to remain calm and pursue their legal business. The governor of Ebonyi David Umahi, who also visited the families of those affected in Ekwashi and Ukwagba, was shocked by the murders. Umahi, represented by the Deputy Governor, dr. Kelechi Igwe was dismayed by how he disapproved of the consent of the Agila people. He noted that the ebonyi had been continuously attacked by the Agillas lately, and called on the federal government to intervene before the people resorted to self-defense. Umahi appealed to people to remain calm and law-abiding to ensure that the government ensured a lasting solution to the crisis. Barr Clinton Odaah, chairman of the affected district of Ohaukwu, claimed that the people of Benue had invaded the people of Ngbo, although a peace agreement was signed with the city council of Ado a few weeks ago. He complained that the incessant aggression of the Agilla people was getting out of hand, just as he asked the Benue governor to call Agila people to order.